I found this post online which is plotting different results for option value and greeks depending on spot price. Why would someone want to do calculate the value of the option with different spot prices? Is not delta what you would use to see the how the option changes with respect to spot price. "Why would someone want to do calculate the value of the option with different spot prices?" Because Delta is the derivative of the option price function wrt spot. 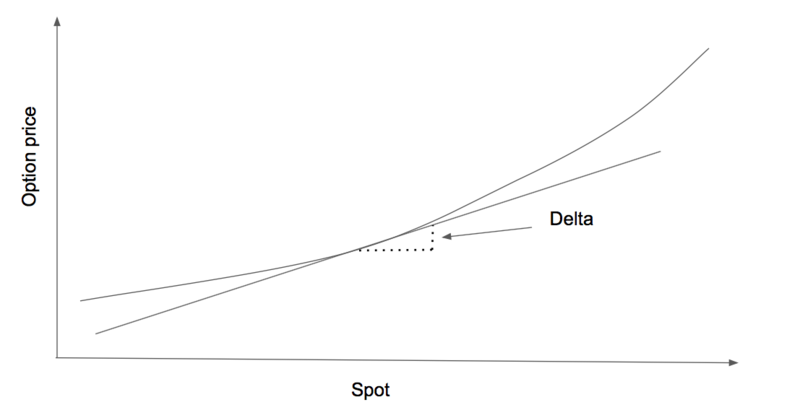 Since the option price function is not linear in spot according to the BS model you cannot get the option prices for different spot just by Delta. What you are asking about is simply using a first order approximation. Understand gamma - delta is an approximation of the price change, but as you extrapolate out, the approximation gets worse. Gamma shows how much delta changes based upon a change in the underlying spot price. So delta and gamma together will give a better approximation. However, gamma is also an approximation of the delta change and also changes as the spot price changes. Not the answer you're looking for? Browse other questions tagged options volatility black-scholes or ask your own question. How do I calculate probability distribution of stock prices given option prices? Option delta - Conditional probability definition? Monte Carlo and PDE results are different for a Call Option!